The phoney war over the roof gave way to a one-way battle. Schmidt's pre-game gambit backfired hugely and nothing worked after that. Wales are Grand Slam champions on the back of a campaign that rarely sparkled but was based on true grit. They have replaced Ireland as the world's no 2 team after accumulating 14 successive wins. Saturday was probably their most impressive. Like England, they targeted the start and produced a superb first try before Ireland had settled. As the rain poured down through the gap where the roof would have been, Ireland made mistake after mistake and paid the penalty. 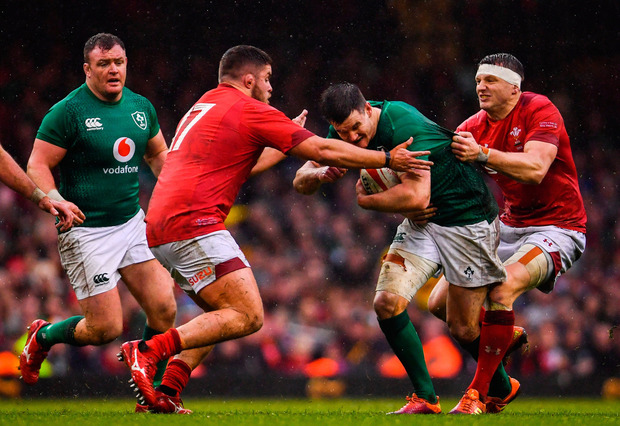 "There are a couple of big areas that we really pride ourselves on to get us into the game and that's usually our set-piece and our discipline and both of those let us down," Rory Best said. "Obviously with the conditions being what they were, to go so quickly into a 10-0 margin behind is incredibly frustrating and it just puts pressure on you and pressure can do very strange things to you. "You have to force it then a little bit and they've got their tails up and there was a little bit of a release of pressure for them because there was a vast amount of pressure and expectation going into a Grand Slam game. "We know what it was like 12 months ago and all you want is to get into the game and be able to fire the first shot and they did that and never looked back. So we'll take a look at why those bits that are normally so strong for us let us down. "We were incredibly disappointed by that but you have to give them credit, they came out very, very hard and very, very fast and they were able to then go really hard at the defence and put us under pressure." His coach cut a frustrated figure as he appealed for support from "genuine fans" and hit out at the team appearing in the media before he had named it. "It is those fine margins," he said of the leaks. "You kind of want to keep a bit up your sleeve as long as you can but at the same time that is not the reason we lost. "The reason we lost is they are a bloody good Welsh team and they had a hell of a lot to play for. "I think they did an incredibly good job of doing it in their home stadium in front of their home crowd and they got them excited early and that was exactly what we didn't want to happen but you don't control those circumstances. "All we can do is dust ourselves off, have a look back at where we took the risks and have a look at where people responded and then build our way forward. "We are a good Ireland team and we will be good. "I would just ask the people keep the faith with the team because we will remain competitive at the top level. I know it is a long way off for us to get the opportunity to demonstrate that but we will try to build a rhythm and clarify exactly who we will need in the group and progress from there." So, while Gatland enjoys his success the Ireland coach picks through the bones of the lowest scoring performance of his tenure. Until Jordan Larmour's consolation, it looked like being the first time his team had been held scoreless. It was historically bad stuff. Trailing 7-0 to Hadleigh Parkes' 61st second try, they were forced to play catch-up but their scrum and lineout struggled and their discipline deserted them. Their handling was poor and the penalties allowed Gareth Anscombe build a tally three points at a time. 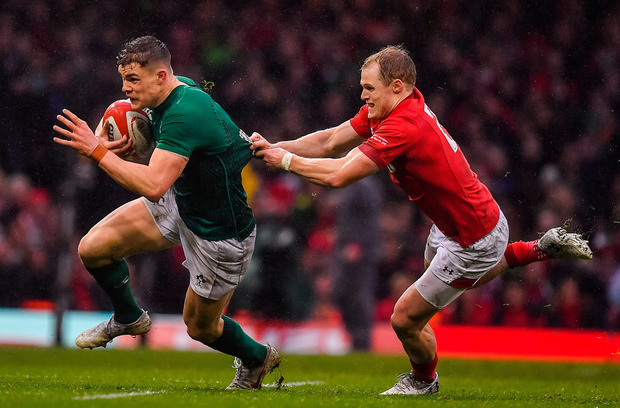 There were moments when Ireland hinted at a revival; Jacob Stockdale almost got away from Johnny Sexton's visionary cross-kick only for Parkes to brilliantly get back and deny him. 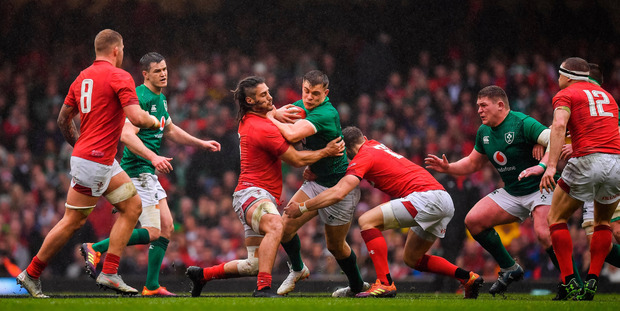 A five-metre lineout came to nothing when Adam Beard splintered the maul and Justin Tipuric swallowed Best up, while a prime attacking position came and went when CJ Stander fluffed his lines when taking the quick tap. It summed up the day. For Schmidt and Best, it was a disappointing way to exit a tournament that has brought them such success. "Obviously, I'm incredibly disappointed," Best said. "On your last Six Nations game you want it to be a fairytale, you want to win and to win in a place like this would have been a massive statement for the team. It would have involved us having a massive performance and that's what you want to go out on. "You don't want to go out on a performance that, individually and collectively, you're not happy with." WALES - L Williams; G North (D Biggar 9), J Davies, H Parkes (O Watkins 71), J Adams; G Anscombe, G Davies (A Davies 57); R Evans (N Smith 52), K Owens (E Dee 61), T Francis (D Lewis 52); A Beard (J Ball 71), AW Jones; J Navidi, J Tupuric, R Moriarty (A Wainwright 71). IRELAND - R Kearney (J Larmour 65); K Earls, G Ringrose, B Aki, J Stockdale; J Sexton (J Carty 73), C Murray (K Marmion 71); C Healy (D Kilcoyne 59), R Best (capt) (N Scannell 65), T Furlong (A Porter 65); T Beirne (Q Roux 59), J Ryan; P O'Mahony, S O'Brien (J Conan 50), CJ Stander.